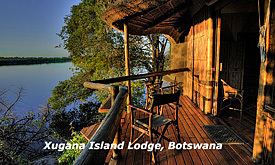 Xugana Island Lodge OR Camp Okavango. Spend two nights on a full board basis and including all safari activities and local brand beverages. After your morning game activity followed by breakfast you are transferred by air to Camp Moremi where you will be accommodated for the next two nights on a full board basis and including all safari activities and local brand beverages. Camp Moremi is situated on the beautiful Xakanaxa Lagoon in the eastern extremity of the Okavango Delta, within the Moremi Game Reserve. Here, where the life-giving waters of the Okavango meet up with the vast Kalahari, ancient Mopane forests, open grassland, seasonal floodplains and riverine habitats have formed, creating one of the most magnificent and welcoming animal sanctuaries in all Africa. Shaded by giant ebony trees the magnificent Moremi Tree Lodge is an elegant elevated thatch and timber structure comprising of a main lounge, wildlife reference library, dining room and stylishly decorated cocktail bar cooled by overhead fans. The large sundeck affords and unsurpassed view of Xakanaxa Lagoon. A curio shop, swimming pool, covered boma and elevated observation platform assures Camp Moremi of its status as Botswana’s finest safari lodge. Camp Moremi accommodates only 22 guests in intimate exclusivity in walk-through East African style safari tents with en-suite hot showers and waterborne toilets. Each tent is exquisitely furnished with a Rhodesian Teak wardrobe, luggage rack, dressing table, bedside pedestals and traditional directors chairs; colorful woven rugs, designer linen and matching interior blinds complete your African hideaway. 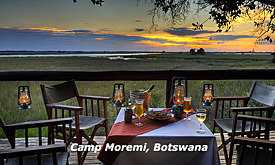 Your stay at Camp Moremi is inclusive of accommodation, all meals, all local brand drinks, game viewing activities, park fees and daily laundry. Moremi Game Reserve supports the most diverse habitat and animal populations in Botswana, with possible sightings of wild dog, cheetah and leopard being highlights. 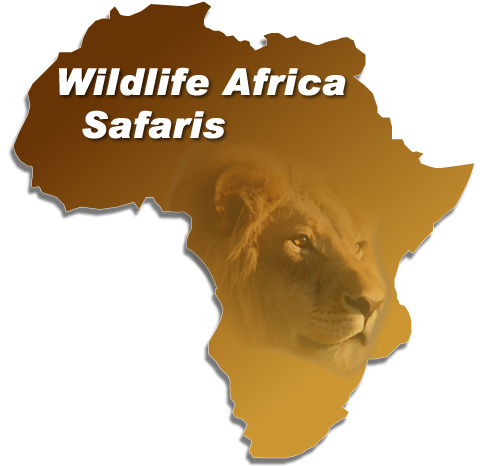 Resident species include lion, elephant, buffalo, hippo, giraffe, hyena, zebra, kudu, lechwe, sable and roan antelope. After the morning activity and breakfast you will be transfer by charter flight to Kasane Airport, where you are met by our representative and transferred by road to Chobe Game Lodge where you will be accommodated for the next two nights on a full board basis and including all safari activities and local brand beverages. 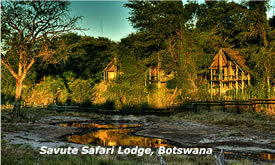 Chobe Game Lodge is situated within the Chobe National Park, approximately 100 kilometres due west of Victoria Falls. The elephant population of Chobe, estimated at times to number in excess of 35 000, is considered to be the largest single concentration surviving within the boundaries of a proclaimed National Park. Other major species such as lion, leopard, cheetah, wild dog, buffalo, sable and roan antelope, red lechwe and the rare puku and Chobe bushbuck are encountered in many parts of the reserve. To counter balance the wilderness Chobe Game Lodge’s forty bedrooms and four luxury suites have been furnished with comfort in mind. The bedrooms are equipped with a punka fan, air-conditioning, telephone, complimentary mini-bar and tea and coffee making facilities. 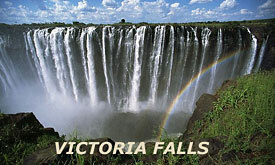 After the morning activity and breakfast you will be transfer by road across the border into Zimbabwe and to the Victoria Falls Hotel. Spend two nights on a standard room, bed & breakfast basis.